Berard - The Mega Transport Experts! The Berard Team is very well versed in the offshore heavy transport market. With our company locations spread out along the Gulf Coast amongst many of the heavy offshore fabrication facilities, we're perfectly situated to handle your offshore projects as we've done for decades for a multitude of clients. We utilize the absolute best equipment and posses the best skilled team members to get the job done right. We specialize in load outs and offloads via self propelled modular transporters as well as strand jack capabilities for sliding / skidding the heaviest of loads. We work hand and hand with some of the biggest offshore fabricators in the world from start to finish, from engineering to final position. When it comes to getting your shipyard projects completed and ready for launch, you can count on the Berard Team. We offer shipyards full transport solutions for the entire construction process from transporting individual modules and hulls within the yard, to the transport of completed vessels to the launch way. We have had the privilege to work with some of the most distinguished shipyards on some of their largest projects to date. They put their complete trust in Berard to carry out one of the most important aspects of their projects and we've come through for them time and time again. Whether your shipyard builds tugs or Navy ships, Berard can handle it. Working in active chemical environments exponentially amplifies the need for safe work practices. Berard's experience proves they are the contractor of choice to meet and exceed facility regulations when it comes to moving heavy objects. 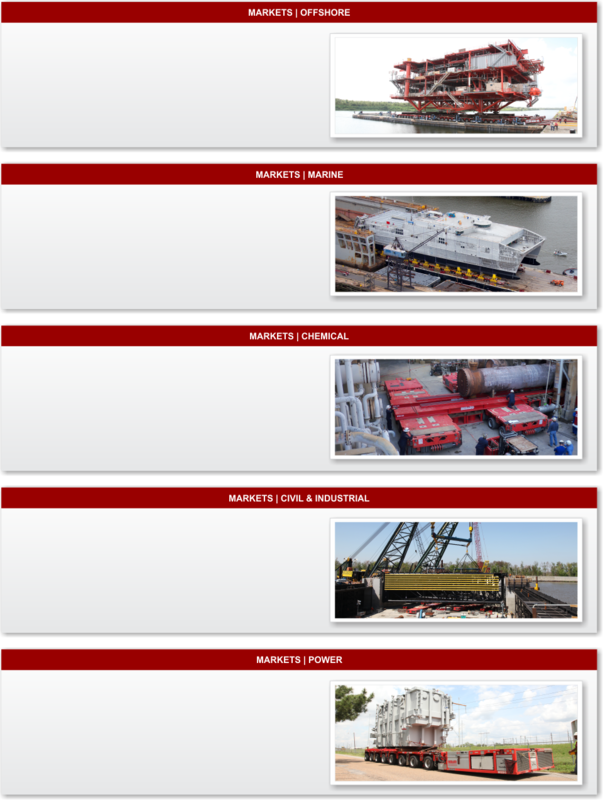 Berard understands developing innovative ways to safely position massive machinery inside of active operating units requires detailed planning as well as a vast equipment arsenal to properly address the project. To further satisfy the working requirements in critical environments, Berard thoroughly trains each employee for the task at hand. Berard is the name to know when it is time to select a heavy transport team to safely execute your next project. You build it, we can move it. Berard is well known to handle some of the largest industrial and civil projects. Our dedicated team of professionals work diligently to find heavy transport solutions to get your projects moved on time and on budget. We've tackled some of the most challenging projects ranging from the transport of a one hundred and fifty year old, four hundred ton oak tree, to transporting, loading out and final positioning of the world's largest pair of sector gates. We transport a wide variety of industrial projects, many requiring innovative engineering solutions to ensure that our client's projects go smoothly as they should. That's the way we do it at Berard. Berard has the power to move your next power project. Sure it may sound cliché , but with today's electrical transformers, generators, and turbines weighing over one million pounds, Berard is the right call for transporting this super-heavy cargo. Berard understands the most cost effective methods of transport, whether by truck, rail, or barge to safely deliver this sensitive cargo to site. To complete the delivery, Berard has the resources to transport, jack, slide, and install massive electrical equipment in the most congested workspaces, along with the safe work practices essential for critical energized environments. For your next super-sized electrical related delivery, trust Berard to help keep the lights on. 3214 W. Admiral Doyle Dr.